This weekend marks the end of Daylight Saving Time. Make sure that you turn your clocks back one hour before heading to bed on Saturday night! 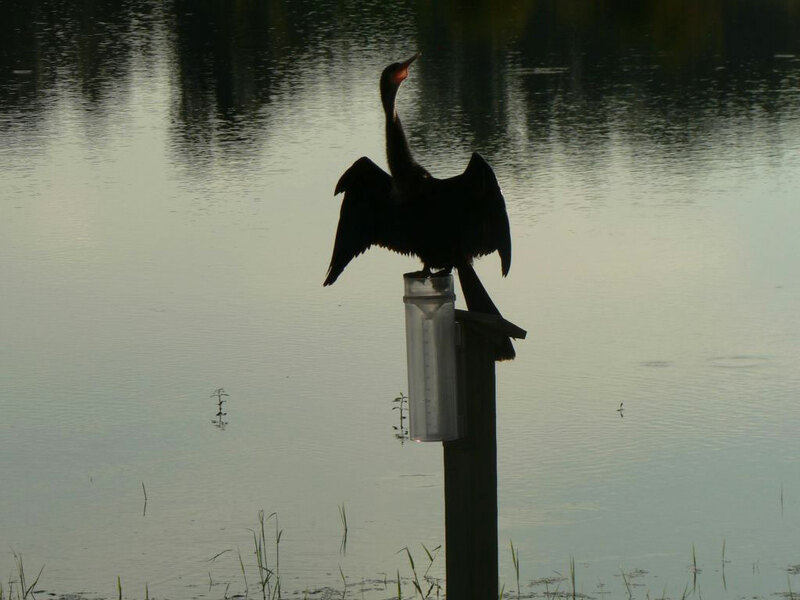 As an observer, you do not need to adjust when you go and read your rain gauge. If you've been reporting at 7:00 AM, then continue to report at 7:00 AM. The days will start getting shorter over the next few weeks as we move closer to the Winter Solstice. We only have 2 more months left in 2012, and these two months are packed with holidays. If you find yourself leaving home for more than a day or two, remember you can make a multi-day observation report upon your return. "There have been problems with birds in the past but I believe this guy, who shows up almost every day, tops most of them. He doesn't hesitate to sound a warning when you get too close." Ahingas (a.k.a. Water Turkeys), unlike most water foul, are not able to waterproof their feathers using natural oils produced in its body, so their feathers become waterlogged while fishing. In order to dry out their feathers to fly again, they will perch themselves and spread their wings for long periods of time. Thanks for the photo, Jim! While Hurricane Sandy made landfall in New Jersey, her impacts were far reaching. Of the 273 Florida severe weather reports for the month of October, 224 of these reports were made from the 25th-31st, which coincides with when Hurricane Sandy, despite being well offshore, impacted most of the eastern coast of the state. 141 of those reports were categorized as high wind, 15 were of coastal hazards and flooding, and the remaining 68 were thunderstorm hazards. Combined with high tides, waves from Hurricane Sandy battered portions of Florida. Below are some pictures taken by the National Weather Service in Miami of some of the coastal impacts on Fort Lauderdale and Deerfield Beach on October 28th. 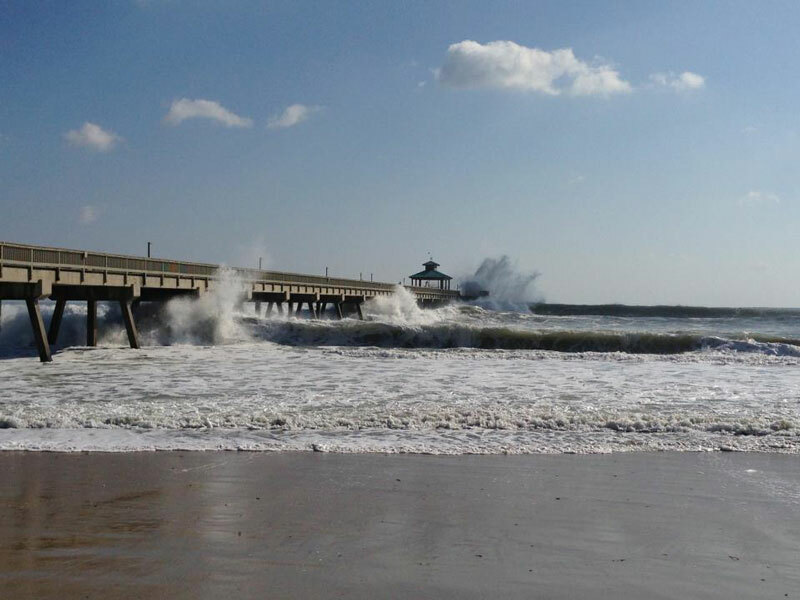 Waves from Hurricane Sandy crashing against the pier in Deerfield Beach, FL. 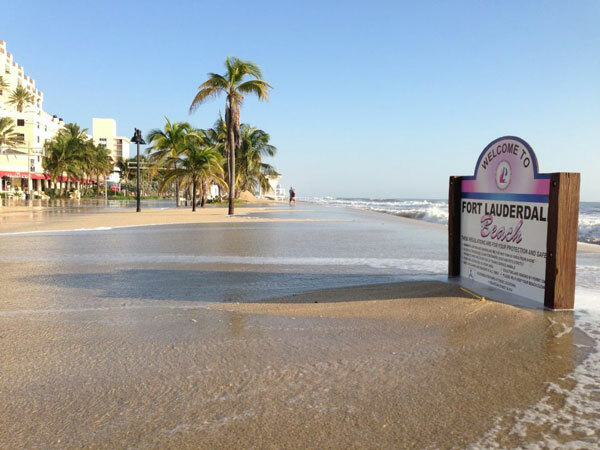 Taken on the morning of October 28th: coastal flooding during high-tide along A1A in Fort Lauderdale Beach, FL. 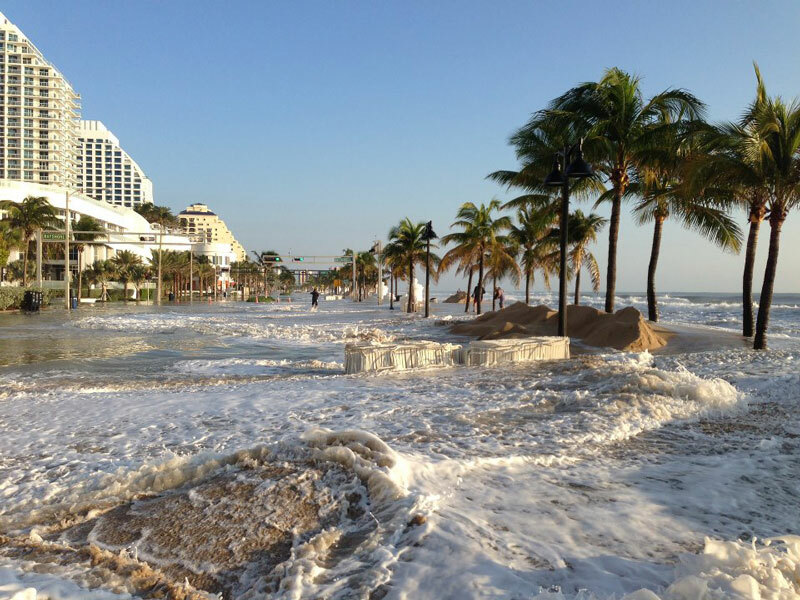 Example of extreme beach erosion caused by large waves from Hurricane Sandy in Fort Lauderdale Beach, FL. On 10/30, NJ-AT-13 reported 4.41" and said, "The eye of the hurricane passed over around 9PM last night. Complete stillness for over an hour. Last year we were in the west side of the eye of Hurricane Irene for an hour as the center passed by just offshore. Twice inside the eyes of hurricanes in just one year. Amazing." DE-SS-15 reported 3.98" and mentioned, "Topped some balkheads in the area, with water at this location 14" before going over. Winds were up to 55 mph. Local minor property damage within the development." And MD-PG-49 (5.50") stated that, "Current conditions at 7AM: Moderate rain. Wind and waves with a few whitecaps on the Potomac River from the SSW, debris. High water level, about a foot shy of the embankment. The wind did not even tear the bird feeder off of the twiggy branch on which it hangs. Temperature: 42�F. USGS 01653600 Piscataway Creek gauge height at 6:30AM: 8.23 feet." You can read through them yourself on the 'Daily Comments' page on the main CoCoRaHS website. Rainfall totals across the state were varied in October (Table 1), with the northern part of the state seeing below normal rainfall, while portions of the interior peninsula and southeastern and southwestern coastal areas saw above normal precipitation (Figure 1). 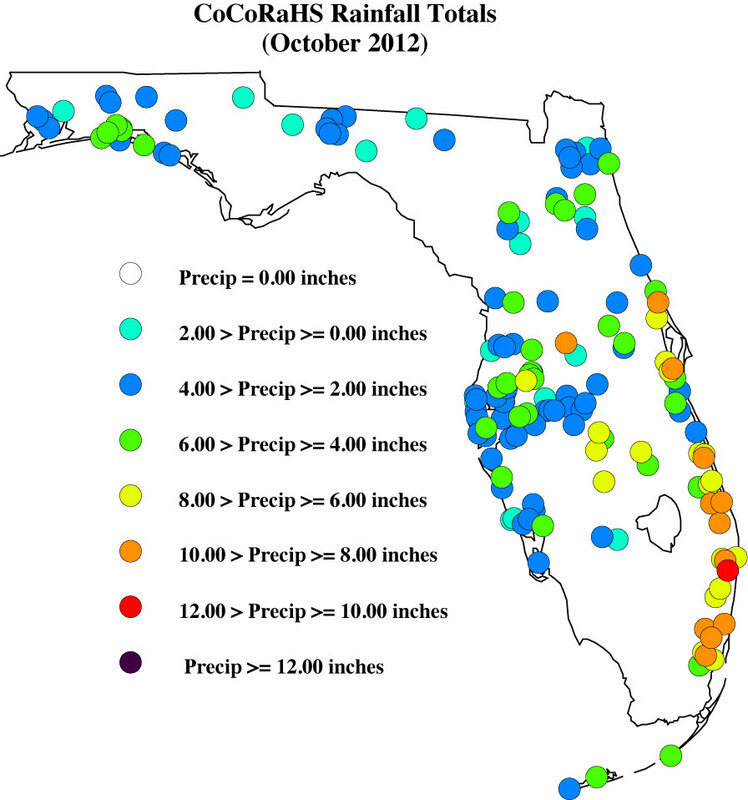 Only a few precipitation records were broken in October (Table 2). 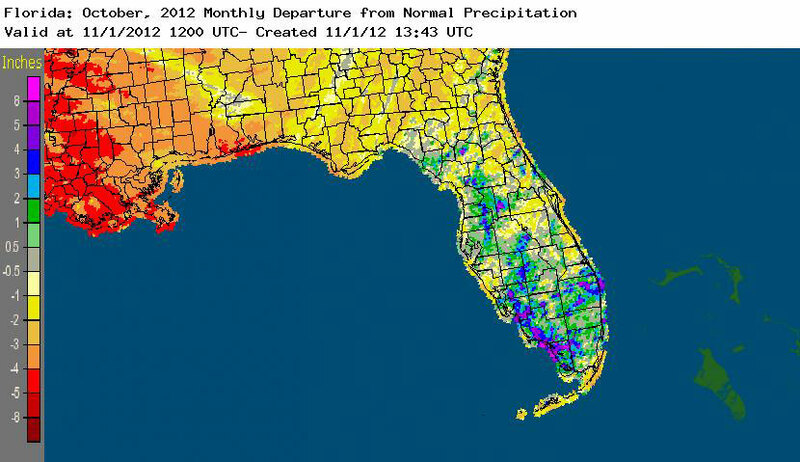 Year to date (01/01/12 to 10/31/12) rainfall total of 85.93" (+32.93") for Miami puts the 10-month period as the wettest on the 118-year record for the location, and 76.85" (+24.05") at West Palm Beach is the 3rd wettest 10-month period. Table 1: October precipitation totals and departures from normal (inches) for select cities. 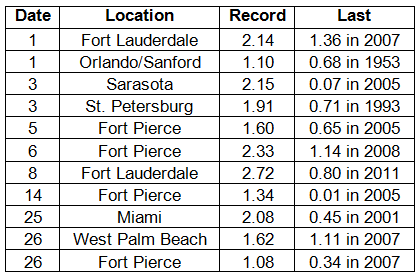 Table 2: Select daily rainfall records (inches) broken during October (compiled from NOAA, NWS). Here are the CoCoRaHS rainfall totals for October from some select CoCoRaHS stations across the state. 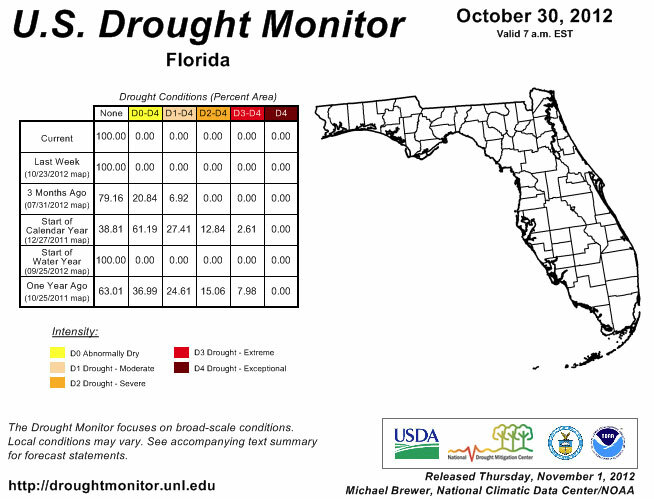 October is typically a dry month for Florida and the observed rainfall varied from below normal to above normal across the state. This was the second month in a row when there was no drought designation in the state. Other areas of the Southeast U.S. saw an expansion of some of the dry conditions, especially in parts of Georgia and South Carolina. Normal rainfall is expected in Florida during the month of November, but the recent dry weather has put the state under an increased fire risk for the next few weeks, as we will remain fairly dry over the next month. Despite the dry weather, Lake Okeechobee's level has risen to 15.87 ft, and most of the rivers in the state are reporting normal river levels. A few reports in Florida were flagged and required some additional information during October. I appreciate how understanding the contacted observers were, along with how quick they were to reply to my email. Please remember if you receive an email from me with the subject line 'Question About Your Recent CoCoRaHS Observation', please take a moment to answer me back. And if you have any questions, please feel free to contact me.